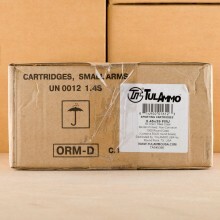 FREE SHIPPING ON BULK 5.45x39 RUSSIAN AMMO! 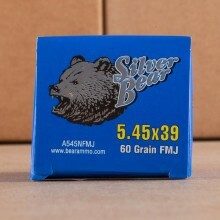 5.45x39 ammo is a bottlenecked cartridge without a rim that was developed in the mid-1970's by the Soviet Union. Looking for a light-weight, fast projectile, 5.45x39 became a favorite among militaries in the former Eastern Bloc. Today's shooters will find most 5.45x39 is produced in the former Soviet Union, Bulgaria, Poland, and other former communist nations. Part of a long line of military cartridges that seemed to favor light weight, high velocity cartridges over power, 5.45x39 ammo is primarily associated with military use but is a great high-volume plinking round for recreational shooters today. In terms of ballistics, you can find 5.45x39 ammunition in both full metal jacket (FMJ) and hollow point (HP). These different bullet types serve specific purposes with FMJ rounds typically used for plinking or training by recreational shooters and HP rounds featuring a bullet that expands and serving best for hunters or shooters looking for a self-defense round. These rounds are very fast, clocking in at nearly 3,000 feet per second and delivering muzzle energy of around 1,050 foot-pounds depending upon the specific bullet weight and cartridge you fire. There are a number of slightly different loads that are closely related to the standard 5.45x39mm round. That standard, known as “7N6”, was improved upon several times as militaries attempted to increase penetration of the caliber into the target. 7N6M: Introduced by the Russians in 1987, this round introduced hardened steel and testing indicated it can penetrate a steel plate as thick as 6mm thick. 7N22: Introduced for military use in 1998, these rounds have a sharp pointed steel penetrator along with a soft lead plug in the nose that allows the jacket of the round to be easily discarded upon contact with a target. These 5.45x39 rounds have a red ring above the round’s neck along with a black tip. 7N24: The most recently introduced variant, this round is also known as “super armor piercing”. Loaded with a penetrator that’s made of tungsten carbide, 7N24 bullets have a black ring above the neck. While once plentiful, imported surplus ammunition has dried up to some extent in the United States due to import restrictions on Russian rounds. You can still find a wealth of rounds in-stock today, typically manufactured by commercial manufacturers. 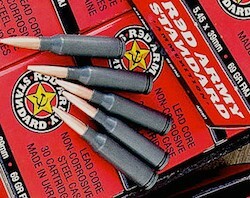 Look for Wolf or Red army Standard ammunition, which are both made in Ukraine as well as domestic ammo producers like Hornady to fill the gap left by the lack of Russian surplus rounds.